[Clean heat to fire] Gardenia flowers open, aromatic. Gardenia, also known as yellow branches, hawthorn, yellow scorpion, jade lotus, etc., are evergreen shrub aromatic plants or small trees of the genus Gentiana, Rubiaceae, and scorpion. Dry branches can be 1-2 meters high, gray; branchlets green. The leaves are shaped like rabbit ears, single leaves, opposite or three impellers, with leathery light and full edges. The flower is solitary on the top of the branch or the leaf axil, the white is thick and fragrant, the shape is large and fat, and the corolla is a high-footed dish. It is like an ancient sprinkling utensil--"Er", hence the name Nizihua (after the Nietzsche "gardenia"). The fruit is ovate, with six longitudinal splits, flat, fruit ripening period in October, flowering from June to August. Gardenia is an indicator of acid soil, so the slightly acidic environment of the soil is the key to the growth of gardenia. The cultivated soil is made up of 70% of sandy loess red soil and 10% of humus leafy. It is preferred to control the pH of the soil between 4.0 and 6.5. Gardenia flowers are humid, and watering should be increased in the growing season. Like warm, humid and sunny environment, it is more resistant to cold, half-yellow, afraid of water accumulation, loose, fertile and acidic sandy loam, native to China. Gardenia, lush foliage, leafy seasons, evergreen, floral aroma, is an important garden ornamental plant. In addition to ornamental, its flowers, fruits, leaves and roots can be used as medicine for purging fire, eliminating the trouble of clearing away heat, diuresis and cooling blood. Its flower language is "eternal love for life and joy." Most of the scorpion plants are low, 1~2 meters high, dry gray, and green branches. Single leaf opposite or main branch three impellers, leaves obovate oblong, with short stalk, 5~14 cm long, tip acuminate, slightly blunt, blade leathery, surface emerald and lustrous, only inferior The stalks are clustered with short hairs and stipules. Flowers solitary branches or leaf axils, short stalks, white, large and succulent, corolla tall-stemlike, generally six-petate, with double-flowered varieties (large flower scorpion), calyx lobes obovate to oblanceolate, anthers Exposed. Berry ovate to oblong, with 5 to 9 winged straight ribs, yellow or orange, 1-loculed, many sessile and sessile. The flowering period is longer, from 5 to 6 months of continuous flowering until August, fruit ripening period in October, the fruit is yellow dye, also an anti-inflammatory antipyretic. The scorpion likes warm, humid, well-lit and well-ventilated environment, but avoids glare exposure. It is suitable for living in a slightly shaded area. It is resistant to half yin, afraid of water accumulation and cold resistance. It can only be used for greenhouse cultivation in northeast, north and northwest. flowers. It is recommended to use a loose, fertile, well-drained, lightly viscous acidic soil to grow a typical acid flower. Can be used for cutting, layering, ramets or sowing. Gardenia is native to most parts of China, and is concentrated in most of China's eastern and southwestern regions, such as Guizhou, Zhejiang, Jiangsu, Jiangxi, Fujian, Hubei, Hunan, Sichuan, and southwestern Shaanxi. 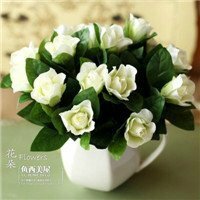 The flower of Yueyang City, Hunan Province is the gardenia flower. Gardenia leaves flourish leaves color seasons evergreen flowers aroma ya green leaves white flowers exceptionally beautiful and lovely for the garden's excellent landscaping materials. It is suitable for pre-stage, poolside and roadside configurations. It can also be used as flower fences, potted plants and bonsai ornamental flowers. It can also be used for flower arrangement and wearing decoration. The peel can be used as a yellow dye wood for hard and fine carving. It is suitable for pre-stage, poolside and roadside configurations. It can also be used for fences and potted plants. Flowers can also be used for flower arrangement and wearing decoration. Gardenia, leaves and fruits are beautiful, the flowers are fragrant, can be used to smoke tea and extract spices; the fruit can be made into yellow dye; roots, leaves and fruits can be used as medicine; the wood is firm and fine for carving. Gardenia contains benzyl acetate, linalyl acetate, ethyl sulphate and other ingredients. Therefore, the fragrance of gardenia is deeply loved by the world. The gardenia extract can be produced by the extraction method using gardenia (the extract yield is 0.1-0.13%), which can be widely used in cosmetic spices and food flavors. Gardenia oil can be produced by steam distillation. (The oil yield is around 0.02%). Gardenia oil can be formulated into a variety of floral fragrances, soaps and cosmetic fragrances. In addition, the benzyl acetate and linalyl acetate of gardenia oil can be separated by a vacuum fractionation method, and used as a main fragrance or a coordinating agent for daily use, and is also commonly used in foods such as chewing gum. .
1. Cold gardenia flower: 500 grams of gardenia, green onion, ginger and the right amount. Wash the gardenia flowers, put them in boiling water, boil them, drain them, let them cool with chopsticks, put them in a white porcelain dish, sprinkle with chopped green onion, ginger, pour sesame oil, old vinegar, Eat salt and monosodium glutamate and mix well. This dish is fresh and tender, with the effect of clearing heat and cooling blood, detoxifying and stopping phlegm. Applicable to lung heat cough, bloated, intestinal wind and other diseases. 2. Hazelnut egg flower: 200 grams of gardenia, 3 eggs, chopped green onion, ginger and the right amount. Gardenia flowers are mixed and washed, put into boiling water and simmered, cut into pieces; egg in a bowl, beaten evenly; put the gardenia in the egg, stir evenly; add oil to the pot, burn to 80% heat, Pour the scorpion egg flower, fry, sprinkle with chopped green onion, ginger, salt, MSG, stir well. The dish is crispy and tender, has the functions of clearing heat and nourishing the stomach, and widening the intestines. It is suitable for stomach hot breath bad breath, swollen gums, poor stool and other diseases. 3. Gardenia fried bamboo shoots: 200 grams of gardenia, 150 grams of small bamboo shoots, 100 grams of bacon, chopped green onion, ginger and the right amount. Gardenia flowers are washed and mixed, slightly simmered; small bamboo shoots are cut into thin slices; bacon is cut into small diced; oil is added to the pot, burned to 60% heat, and the gardenia, small bamboo shoots and bacon are poured into the pot together. Stir fry several times, add chopped green onion, ginger, stir fry until cooked, add MSG, salt. This dish is light and fresh, crisp and refreshing. It has the effect of strengthening the spleen and appetizing, clearing the heat and intestines. It is suitable for stomach stagnation, diet reduction, abdominal distension and knot. 4. Gardenia fresh soup: 150 grams of gardenia, 100 grams of lean pork, 30 grams of mustard, chopped green onion, ginger and the right amount. Gardenia flowers to wash, slightly dipped, drained water; pork shredded; add water to the pot, boil and then add gardenia, pig lean meat, mustard, then cook until the pork floats, simmer, add Chopped green onion, ginger and other five flavors, served in a soup bowl. This soup is fresh and refreshing, and has the effect of nourishing the stomach and replenishing the heat. Applicable to physical deficiency, poor intestinal bleeding, poor bowel movements, cough and phlegm, swollen gums and other diseases. 5. Flower tea: Dry the flowers and brew them. The method is to remove the flower buds or the first flowers, remove the flower buds and peduncles, spread the corolla down into a thin layer, and dry them in a simmer or oven. Turn it from time to time during drying to make it evenly heated. After drying, put it in a sealed container and store it in the refrigerator. When drinking, directly brew with hot water, add rock sugar, honey, etc. to increase the sweetness. 6. Marinated preserves: After the petals are salted, wash them with cold water and drain them. Add the sugar in a ratio of 1:2 to the petals and mix them in a sealed container for 3 days. 7. Another cold food method: first salt, usually the petals are salted, put into the container, take out before eating, rinse off the salt with boiled water, add some seasonings, such as sesame oil. When you are hot, try to reduce the time to avoid discoloration. After the flowers are put into hot water, they are quickly taken out. Loaded into the pan and ready to eat. Other flavoring agents can also be added as desired. 8. Deep-fried: Use flour, egg juice, and water to prepare a batter. It is better to not expose the petals. Put it in a frying pan and heat it to golden brown. 9. Hazelnut honey soup: fresh hazelnut flower 9~15g, a little honey. Add water to decoction. This party originated from "Minnan Materia Medica", scorpion flower clearing lung heat, honey moist lung dry. For lung heat or lung heat, cough, or hemoptysis. 10. Gardenia fried leeks: fresh gardenia, remove the flower and so on, only the petals are good. Boil the water, put the gardenia flowers in the wash, and change the color slightly. Remove and drain, wash the leek, cut into 3 inches long and cut it together, stir the leek and gardenia together until cooked. If you eat chili, you can put less than red pepper, red, yellow, green, white, and bright color. Amaranth kidney, scorpion diuretic. Its appearance makes you feel impeccable. We usually say that the gardenia is very appreciated, how does it have appreciation value? The gardenia leaves are lush, the leaves are evergreen, the flowers are aromatic, the green leaves are white, and the flowers are extraordinarily beautiful and lovely, which is the beautiful beautification in the courtyard. Material, which is suitable for front, poolside and roadside configurations. It can also be used as a hedge, potted plant and bonsai. Flowers can also be used for flower arrangement and wearing decoration. A delicate and delicate flower will give off a fresh fragrance from time to time. People stay in love. It can make a qualitative change in the home environment. The biggest characteristic of a gardenia flower is its floral fragrance. As long as you plant one plant at home, you can smell it in a few hundred squares. Imagine that in your home, the space is about one hundred square meters, no matter which one you go to. The smell of gardenia smells in the corner, how enjoyable it is! It has a lot of functions to beautify the home. If you put a gardenia flower next to the TV at home, beautify the indoor space and absorb the harmful radiation in the room, and occasionally release the fragrance, cover up the plain and even unpleasant smell, exchange the air for the space, and make the whole The home is full of poetry. 1 big leaf scorpion: var.grandiflora Nakai., also known as the big flower scorpion: cultivar, leaves large, large and rich, rich, and no effect. 2 water scorpion: plant is short, small flowers, small leaves, double petals. 3 scorpion scorpion: also known as small flower scorpion, garland. The plant is short and live, the leaves are small and narrow, and the needles are lanceolate. The flowers are also small and have a strong fragrance. Flower double petals. 4 yellow scorpion: also known as hawthorn, is the wild species of gardenia. The leaves are slightly smaller, the flowers are single-lobed, and the orange-red fruits are in autumn. They are not withered for a long time, and have strong alkali resistance, which is a good tree species for flower viewing and fruit viewing. 5 ovate scorpion: var.ovalifolia Nakai. Leaves obovate, apex round. 6 scorpion scorpion: var.angustifolia Nakai. The leaves are narrow and wild in Hong Kong. 7 variegated var. aureo-variegata Nakai. Leaves with markings. 8 lobular scorpion: evergreen shrub, plant dwarf, branches flat, leaves narrow and long, inverted lanceolate, opposite or three impellers, stipules membranous sheath, flowers smaller than solitary in leaf axils or branches, calyx tube Ribbed, corolla tall-striped, white, double-lobed, aromatic; fruit ovate, with 6 longitudinal ridges. About 250 species are distributed in tropical and subtropical regions. There are 4 species in China, producing from southwest to east. Among them, medlar is the most common, and the fruit is used as a yellow dye and is also a garden ornamental plant. Soil: Gardenia is an indicator of acid soil, so the slightly acidic environment of the soil is the key to the growth of Gardenia. The cultivated soil is made up of 70% of sandy loess red soil and 10% of humus leafy. It is preferred to control the pH of the soil between 4.0 and 6.5. Soil, water and fertilizer contain alkali, so that the plant can not absorb iron, but affect the formation of chlorophyll, so that the branches, leaves, and even death. Use fertile, loose, well-drained acidic soils, such as the pine sawdust into the soil, the effect is also very good. Temperature: The optimal growth temperature of Gardenia is 16 °C - 18 °C. The temperature is too low and the direct sunlight is extremely unfavorable for its growth. Therefore, in summer, the gardenia should be placed under the sparse forest or the shed under good ventilation and air humidity. In the winter, the environment where the sun is shining and the temperature is not lower than 0 °C is allowed to dormant. If the temperature is too high, it will affect the flowering in the coming year. The growth period is 18~22°C, and the wintering period is 5~10°C. Below -10°C, it is easy to be frozen. Avoid sun exposure, but often people mistakenly believe that gardenia requires all yin, causing mistakes in cultivation. In fact, while paying attention to cultivating its cool environment, it is necessary to maintain 60% of the light throughout the day to meet its growth needs. .
Moisture: Gardenia prefers air to be moist, and watering should be increased in the growing season. Usually the potting soil is white and can be watered, once poured. It is hot in summer and must be sprayed 2 times to 3 times a day to increase the humidity of the air and help the plants cool down. However, after the flower is bud, the watering should not be too much, so as not to cause the falling bud. Watering in winter is better to prevent the water from ruining. If the air humidity is lower than 70%, it will directly affect the flower bud differentiation and the growth of the flower buds. However, too much wetness will cause the root rot and the yellow leaves to fall off. In addition to normal watering, water should be sprayed frequently on the foliage and nearby ground to increase the humidity of the air. Fertilizer: Gardenia is a plant that prefers fertilizer. In order to meet the demand for fertilizer in the growing season and maintain the slightly acidic environment of the soil, the ferrous sulfate can be mixed into the fertilizer solution for fermentation. After entering the growing season in April, you can topdress once every half month (it is best to use more water when fertilizing to prevent burning). This can not only meet the demand of fertilizer for gardenia, but also maintain the soil environment in a relatively balanced micro-acid environment to prevent the occurrence of yellowing, while avoiding the assault of ferrous sulfate, local peracid on gardenia hurt. Fertilizers such as bean cake, sesame sauce, peanut bran, etc. should be applied. Fermentation can be acidic after being fermented, but it must be applied with thin fertilizer. Avoid heavy fertilizer and fat, and do not apply fertilizer during hibernation. If the planting is less than three years, it is forbidden to apply manure. Excessive application of nitrogen fertilizer will result in thick branches, large leaves, and thick green, but not flowering. When there is phosphorus and potassium deficiency, there will be no flowering or buds withered and shedding. Breeding: Although there are many ways to breed gardenia flowers, the easiest and quickest way is to float the water. First, find a piece of foam board and punch it up. Cut the hazelnut flower into half a ripe branch and insert the foam board. In the hole, then put the foam board into the bucket filled with water, and put the bucket in an environment that can make the drifting strips shade and allow the sunlight to illuminate the bucket, and control the water temperature at 18 °C - 25 °C. In the meantime, gardenia can grow more than 3 cm in one week. This method cuts the gardenia flower and the survival rate is 100%. Pruning in time: The germination of the scorpion is strong, the branches are easy to overlap, the air is not ventilated, and the nutrition is dispersed. When the shape is normal, three main branches should be selected according to the tree shape, and it is required to cut off other branches erupted by the roots at any time. After the flower is thanked, the branches should be shortened in time to promote the sprouting of new branches under the cut. When the new branch grows three quarters, it is topped to avoid blind growth. Gardenia can be propagated by various methods of sexual reproduction and asexual reproduction. Generally, it is propagated by cutting method and stripping method. It can also be propagated by ramets and sowing methods, but it is rarely used. Generally, northern potted plants are not easy to receive seeds. Generally choose full-bodied, deep red ripe fruit, even shell or dry to seed, before planting, use scissors to cut the seed peel, dig out the seeds, smash in hot water, remove the floating seeds or impurities, and then The sinking and enriched seeds are taken out and spread on the bamboo mat, and the ventilation is used to dry too much water. Generally, it is selected from Xiangyang Hillside or Tufang, and the soil layer is planted with loose and fertile sandy loam. It can be planted in the field of the field, or interplanted with legumes. Before planting, plow the ground 1~1.5 feet, remove the miscellaneous wood tree pockets, and smash the surface by 4~5 feet wide (the soil quality can be larger, otherwise it is smaller), the height is 6 inches, and the soil can be mixed. Green manure or human and animal manure water is used as the base fertilizer. For example, 20 to 30 tens of manure is applied per acre. After the soil is dry, the mud is shallow and the surface is flattened. In the kneading surface, the seeding ditch is opened at a line spacing of 6 to 7 inches, and the ditch is about 1 inch deep to be planted. Gardenia can be spring or autumn, usually in the spring, spring sowing in the rain before and after the autumn, in the autumn before and after the autumn, when the seeds are mixed with the fire ash evenly planted in the seeding ditch, and then with fine soil or fire The soil covers the flat sowing ditch, the grass is covered with water, and the soil is often kept moist to facilitate the emergence of seedlings, 4 to 6 kg per acre. After emergence, pay attention to remove the grass in time. During the seedling stage, weeding should be carried out frequently. Be careful not to damage the roots of the seedlings. After weeding, it is necessary to trace the human waste water. After the seedlings can be transplanted one year later. If the transportation is far away, it is advisable to use the yellow mud slurry root and cover the grass to moisturize. One plant per hole, cover soil, compaction and water spray. After planting, each year of cultivating, weeding and topdressing in spring and summer, and applying manure, manure, compost, cake fertilizer, etc. Before the flowering in summer, the fertilizer with more phosphorus and potassium content is better, and the fertilization is generally carried out after weeding and loosening the soil. During the growth process of Gardenia, the leaves are often yellowed, which is mostly caused by the imbalance of cultivation management. Too much water, too much sun, too weak, too much fertilizer will cause yellowing of the leaves, but the situation of yellowing is not the same, should be carefully observed and analyzed, and corrected. [Water yellow] The young leaves are dark yellow and dull, the old leaves have no obvious changes, the branches are fine yellow-green, and the new shoots are not shrinking, indicating that there is too much watering. Place the flower in a ventilated, cool, self-blowing dry soil mass and then put it back into the basin. [Yanhuang] Yellow water is not the same as yellow water. The yellow water is the tip or edge of the leaves, and the hair is dry. The old leaves fall off from the bottom to the top, but the new leaves grow normally. Pay attention to watering and pouring when watering. [Broken yellow] Strong sunlight directly onto some flowers (such as spider plants, maize, etc. ), which may cause flower leaves and leaves to dry, and yellow spots appear in the sunny part of the leaves. Move to the shade. [Lack of light yellow] Long-term shaded environment, the leaves can not get enough sunlight, can not form chlorophyll, the whole plant leaves turn yellow and then fall off, supplemental light can avoid this disease. [Fat yellow] The yellowing of flowers caused by excessive fertilization or excessive concentration is characterized by dry brown at the top of new leaves. Generally, the leaves are thick and dull, and the unevenness is not stretched, and the old leaves are yellowed. Fertilization should be stopped immediately, and some of the fertilizer should be washed with a large amount of cleaning. [Fatty yellow] shows that the color of the young leaves is light, yellow or light green, while the old leaves are normal or gradually turn from green to yellow. Check the potting soil. If there is dry knot, the soil should be changed. Usually, the thin fertilizer should be applied frequently and some water should be poured at the right time. [Inappropriate water and fertilizer] During the growth of Gardenia, the water and fertilizer are excessive, causing the branches to grow. The nutrients are mostly used for the growth of vegetative organs (roots, stems, and leaves). The reproductive organs (flowers or seeds) lack nutrients, affecting the formation of flower buds, resulting in no Flowering or flowering is rare, even if it can bloom, it is easy to fall flowers and fall buds. This phenomenon is often caused by excessive application of nitrogen fertilizer and lack of phosphate fertilizer. Because of insufficient phosphate fertilizer, it will affect flower bud formation. Therefore, in the flower bud differentiation period, it is necessary to increase the application of flower fertilizer or 0.2% potassium dihydrogen phosphate solution with more phosphorus fertilizer, which is beneficial to the formation of flower buds and pregnancy buds. During the bud stage, the fertilization is too thick, and the watering is often too little, which is easy to cause falling flowers and buds, flower growth period, lack of fertilizer and less water, poor plant growth, thin and short, and easy to cause less flowering or small flowers and poor flower quality. [Light temperature is not suitable] (Scorpion flower summer is half-yellow, winter can be full of sunshine indoors) Because the flower origin is different, so the ecology is different, some like the light, some should be half-yin; some like warmth, there are The likes are cool, some are warm and moist, and some are resistant to drought. If the living conditions required by each are not satisfied, it is easy to cause falling flowers and falling buds. [High soil salinity and alkalinity] Gardenia flowers are slightly acidic, and are afraid of saline. Even more salt-tolerant flowers, such as geranium, rose, etc., when the soil contains more than 0.1% salt and the pH exceeds pH 7.5, it will affect its growth and flowering. This is because the soil has the best nutrient availability under the slightly acidic strip of pH 6-7, so it is most suitable for flower growth and development. Acidic soil not only affects flowering. In severe cases, the plants will die. [A long time pruning] If the gardenia is cultivated for a long time, the branches are messy, which not only affects the appearance, but also consumes a lot of nutrients and affects the formation of flower buds due to many unnecessary branches. It also causes no flowering or less flowering. one of the reasons. [Winter room temperature is too high] Gardenia is in a dormant or semi-dormant state in winter, and room temperature is about 5 degrees. Even if some warm flowers, such as Milan, glass, etc., the room temperature should not exceed 12 °C. Pomegranate, rose, peach, potted grape, fig, etc. are suitable for low temperature (about 0 °C). If the room temperature is too high, it will affect the fully dormant or premature bud leaves of the flowers and trees, consume a lot of nutrients, grow weak in the next year, do not bloom or the flowers are small and easy to fall. [Infestation of pests and diseases] During the growth and development of Gardenia, it is often susceptible to pests and diseases, damage to growth, affecting nutrient accumulation, and is also a cause of falling flowers and buds. Gardenia is often prone to leaf yellowing and leaf spot, and leaf spot is sprayed with 600% dexamethasone WP 600 times. The insects are harmed by thorn moth, scale insect and whitefly. The moth is sprayed with 2.5% enemy killing emulsifiable concentrate 3000 times, and the scale insect and whitefly are sprayed with 1500 times of 40% omethoate emulsifiable concentrate. Yellow disease: It is more common, caused by a variety of reasons, so it is necessary to take different measures to prevent and control, generally manure or manure. When the iron is deficient, the veins of the young leaves are chlorotic and yellow, which will cause the whole leaves to yellow, and even the leaves and branches will wither, and finally the plants will die. In this case, a 0.2% to 0.5% aqueous solution of ferrous sulfate can be sprayed for control. The yellowing caused by magnesium deficiency gradually develops from the old leaves to the new leaves, and the veins are still green. In severe cases, the leaves fall off and die. In this case, it can be sprayed with 0.7%-0.8% boron magnesium fertilizer. Too much watering, freezing, etc., can also cause yellow leaf phenomenon, so pay special attention to the maintenance process. The phenomenon of nitrogen deficiency is simple leaf yellow, and the new leaves are small and brittle. The phenomenon of potassium deficiency is that the old leaves turn from green to brown. The phenomenon of phosphorus deficiency is that the old leaves are purple or dark red . Soot disease: occurs in branches and leaves, can be scrubbed with water after discovery, or sprayed with 0.3 wave of sulphur sulfur mixture, 1000~1200 times carbendazim. Rot disease: often occurs on the lower trunk, stalk enlargement, cracking, immediately after the discovery, scraping or coating 5~10 degrees stone sulfur mixture, several times can be effective. Leaf spot: Sprayed with 600% dexamethasone WP 600 times. The pests that harm the scorpion are aphids, beetles and larvae, the first two available dimethoate, trichlorfon, and the latter can be controlled or manually captured with 666 powder. Gardenia pest control. In addition, gardenia is prone to scale insect damage and is associated with soot mites when the indoor ventilation is poor and the temperature and humidity are too high in winter. The scale insects can be scraped off with bamboo sticks or small brushes. It can also be sprayed with 100# petroleum emulsion plus 100~150 times water. The soot disease can be scrubbed with water or sprayed with carbendazim 1000 times. There are also the damage of the moth, scale insect and whitefly. The moth can be sprayed with 2.5% enemy killing emulsifiable concentrate 3000 times, and the scale insect and whitefly can be sprayed with 40% omethoate EC 1500 times. Gardenia flowers are good for fertilizer, but it is better to apply more fertilizer. The soil is slightly acidic and well drained. After the seedlings are transplanted, they can be topdressed once a month; each year, they are trimmed once every 5 to 7 months, and the top tips are cut to promote branching to form a complete canopy. The adult tree is removed from the flower, which is beneficial to the blooming of flowers and prolong the flowering period. Potted hazelnuts should be poured out of the water in time after the rain, and the fertilizer should be applied in time. In the north, it is often the first year to introduce the gardenia from the south. The flower is large, and the second year becomes smaller. The leaves turn yellow and fall off easily. In severe cases, the plants die. The main reason is that the soil in the north is alkaline, the climate is dry and the water quality is not suitable for its growth. Therefore, from the south, it should be transplanted as much as possible. Usually, the rainwater stored in the pond or the green grass and the skin can be soaked in water without salt and water. If it can add 0.1 kg of ferrous sulfate in 50 kg of water, the effect is better. During the growth period, it is fertilized with water and can promote the flourishing of the branches and leaves, and the leaves are dark and green. In the spring and autumn, the growth is slow. Apply thin liquid fertilizer every 2~3 weeks. After the summer, the temperature will rise and the growth will be strong. It can be used for 7~10 days with liquid fertilizer once. In the morning and evening, you can use the clear water to immerse the leaves and the nearby ground to increase the humidity of the air. Before the autumn frost, move into the environment where the winter temperature is not lower than 0 °C. It should be planted in the deep sandy loam soil of Xiangyangshan slope. It can be planted in the field of the field or interplanted with legumes. Before planting, remove the whole tree and remove the miscellaneous wood tree pocket. According to the plant spacing of 4×4 feet, the hole width is 1 ft. The square depth is 0.8-1 ft. Each hole is mixed with 10-15 kg of soil and mixed with soil to be planted. Land selection, soil preparation, and soil requirements are not strict, and can be used for hillside, earthen, field, and corner cultivation. In the selected site, according to the row spacing of 4-6 feet, the soil quality can be better. Otherwise, the small hole diameter is one foot deep and 0.8-1 feet. The soil is rich in fertilizer or human and animal manure as the base fertilizer and fertilizer. Planting should be selected in the cloudy days of 3-4 months. After the seedlings are unearthed, they should be planted in time. Do not wind and sun. If the transportation is far away, it is advisable to use yellow mud slurry to cover the grass to moisturize each layer of soil, compaction and watering. After planting, each of the cultivating, weeding and topdressing in spring and summer can be applied to human and animal manure, manure, compost, cake fertilizer, etc. Fertilizers with more phosphorus and potassium content before flowering in summer are generally applied after weeding and loosening. The roots, leaves and fruits of Gardenia can be used as medicine for purging fire, eliminating irritability, eliminating inflammation, heat, clearing heat, diuresis, cooling blood and detoxifying. In addition to ornamental flowers, fruits, leaves and roots can be used as medicine or tea. Scorpion contains scorpion scorpion, scorpion scorpion scorpion, chicken scorpion scorpion methyl ester and a small amount of hawthorn have heat diuretic, cooling blood detoxification, jaundice, bloody pain, redness and swelling, fire sores, drop Blood pressure and other effects. Among them, the scorpion fruit is used as a medicine for treating fever, high fever, upset, insomnia, real fire, toothache, mouth, sore, nasal sputum, blood, eye, conjunctivitis, sore, swollen, jaundice, infectious hepatitis, faba bean disease, urine, external use, treatment of traumatic bleeding, contusion. The root medicine is infecting infectious hepatitis and hurting the wind and toothache. "Compendium of Materia Medica" refers to its "Yue Color "Thousand Gold Wings" cream used." "Minnan Materia Medica" said that it "diarrhea lung fire lung heat cough, stop nose and blood stasis." [alias]: Mudan, fresh branch, medlar, peach, water cross branch, branch flower, hawthorn flower, yellow chicken, yellow medlar, scutellaria, scutellaria, scutellaria, jade lotus, white peony , Zen flower, bowl and so on. [Method]: When the flowers are taken at the beginning of summer, the flowers are harvested, dried for use, or used fresh. Harvest the fruit from September to November, remove the impurities such as the fruit stalk, and cook it in the steamed or boiling water (can be added with alum), remove it and dry it. The fruit is not easy to dry, so it should be frequently turned to make it well ventilated to avoid mold and deterioration. Roots are harvested in summer and autumn, washed and dried. The hazelnut cultivation begins to bloom in 2 to 3 years. From November to December, the fruit begins to mature. When the peel is yellow-green, it can be harvested. Choose sunny picking, and harvest the scorpion in time to dry or dry. [Sexual taste back to the classics]: Sexual cold, sweet and bitter; into the lungs, liver. 【Indications】: Qingfei cough, cooling blood to stop bleeding. Indications for lung heat cough, nose, sputum, swollen poison and other diseases. [Main Ingredients]: Gardenia contains three components, gardenia acid A, B and acid. Containing volatile oils, including benzyl acetate, linalyl acetate, and other pigmented enamel, wood mellow and the like. In addition, it also contains carbohydrates, protein, crude fiber and a variety of vitamins. Clearing heat and cooling blood, scorpion flower bitter cold, can blood and clear evil heat, is a supplementary treatment food for sore swollen poison, intestinal wind sputum, blood heat and other diseases. Resolving phlegm and relieving cough, the active ingredient of gardenia can inhibit the growth of bacteria, release sputum and smooth airway, and has the effect of relieving phlegm and relieving cough, and can be used as a therapeutic product for phlegm and cough. Wide bowel laxative, anti-cancer, Gardenia contains cellulose, can promote the peristalsis of the large intestine, help the excretion of stool, prevent the onset of hemorrhoids and the occurrence of rectal cancer. Note: Gardenia bitter cold, spleen deficiency diarrhea, kidney yang deficiency, careful food. [Cold and high fever]: 60 grams of medlar root, 30 grams of mountain roots, 60 grams of duck skin in the second layer of skin, 30 grams of safflower root, decoction, the effect is very good. [Yellow sputum hepatitis]: Use 30~60 grams of medlar roots, add lean meat to cook, about half a month, jaundice can be retired. [Dysentery]: Use the scorpion root with the rock sugar stew, the effect is very good, and even served for 7 days. [Redness and swelling of the eyes]: 9 grams of medlar leaves and chrysanthemums, 6 grams of scutellaria, gentian, and licorice, decoction with water, and even served for 15 days, the effect is very good. [Hypertension]: Drinking tea with hazelnut leaves has the effect of lowering blood pressure. [Rotten sore]: Juice with scorpion leaves, wiped on red and swollen sores, 7~10 days effect is remarkable. [Tangsitis]: 10 grams of medlar, 30 grams of fresh medlar root, Shuijianbi. [Sound hoarse]: 5~7 flowers of gardenia, brewed in boiling water, on behalf of tea. [Stomach pain]: Scorpion 7~9 pieces of scorching, add ginger amount, Shuijianbi; 30 grams of medlar root, 20 grams of rock sugar, stewed. [Lung heat cough]: 3 eggs are cooked and peeled off, 30 grams of gardenia flowers are cooked for half an hour, 3 times a day; 15 grams of gardenia are marinated with 30 grams of sugar for half a day, each taking a little, soaking Tea. [Scarred redness]: 12 grams of medlar, dandelion, honeysuckle, decoction, 1 dose per day, divided into 3 doses.